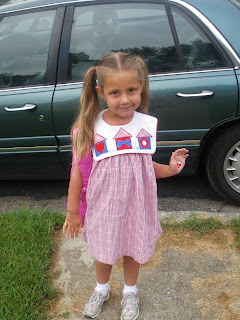 Frances finished her first week of Kindergarten on Friday. SHE LOVES IT! She has all kinds of stories at the end of the day and thinks she is a huge deal now because she is in Kindergarten! She comes to the day care after school, so she still gets to see some of her old friends. On Tuesday when she came in, she went down to the three-year-old class and said, "I'm here now Ms. Ariel. If you need me to take any kids to the bathroom, I can help you out." HAHA She thinks she is hot stuff! She comes into my classroom in the afternoons and says, "Okay, boys and girls. Do you want to learn something?" She loves her teacher, Mrs. Luden. There are things that I have already taught her or tried to teach her (like coughing into her elbow) that she has never paid attention to, but when Mrs. Luden says it, it's gospel. 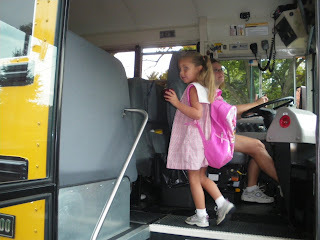 She loves riding the bus in the morning. 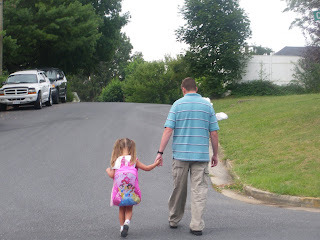 I even let her walk to her bus stop by herself (It is a block away and I followed her in the car.) and she loved it. Henry cries whenever he sees her get on the bus from a combination of wanting to get on the bus himself and from missing his sissy. He's so pitiful. When he sees her come into the daycare in the afternoons he starts asking for her so he can give her a hug. They love each other so much! How did I get so lucky?! As a side note, Frances has her first loose tooth. It is on the bottom, directly right of center. She wants to eat an apple so it can come out. It's not that loose, but it won't be long. So cute! Looks like she is a teacher in the making like her mommy! Glad she is enjoying her first year of school!